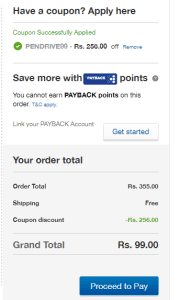 Hello Dealsnloot Readers,Ebay is back again with Flash Sale where new users of Ebay can grab 16GB Pen Drive in just Rs.99. Now no need to do any extra task like submit form and wait for the coupon, just create new Ebay account and buy it instantly.So Hurry !!! Grab This Loot Deals And Offer. Pay Via Your Suitable Payment Method. Note :- If the user is not a First Time transactor on eBay, then he/she will not be eligible for this product. Manufacturer warranty of 2 years is applicable on this product. Hence, it will not be covered under eBay Guarantee.